Not very sure this is a bug. May be related to how shaders work ! Was just wondering, if I shade some Points Mesh with a Shade with Unlit Image, and combine these guys, I can rotate the grouped 3D objects with an interpolated Curve on the rotation transform port. Works great. The same happens when shaded with Shade Edges with color, but that node description says plane surfaces won't work and render an opaque color instead, so I'm already happy they shade the Mesh Points, even when rotated, and I hope that won't be broken, cause I like it. I like to use it as a workaround Steve gave me, because it allows to shade particles with alpha until the Feature Request Disregard Depth Masking is implemented. This of course happens using the amazing Intel HD 3000 GPU (which all Nvidia Titan X users cherish to own one day ;)). I'm always pretty amazed by the FPS dropdown when using points with some dimensions greater then 0,1. Here for example I've got 12 Point Meshes and the FPS is about 35. Big 3D squares would not drop the FPS down, but I guess 3D points are computer heavier. Or related to the unique HD 3000. Joining the composition and a screenshot. 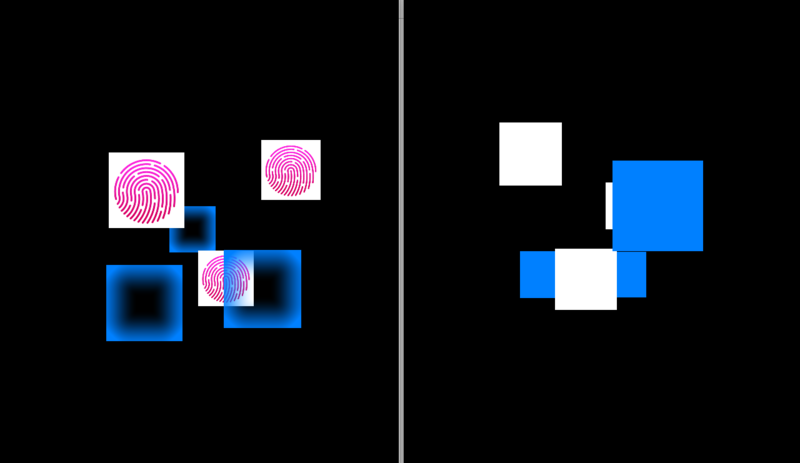 One window renders the Rotation, the other the noise distort. Ha :) In fact, the problem of the shader disappearing is not specific to your GPU. It's a problem with how Add Noise to 3D Object processes the mesh. We'll get this fixed. However, this one is specific to your GPU. Points are rendered using a geometry shader, which causes software fallback on the Intel HD 3000 (it processes on CPU instead of GPU, making it slower). We submitted a support request to Apple a while ago and are still waiting to hear from them. We fixed the disappearing shader in Vuo 1.2.4. The slowness due to software fallback on your GPU is covered by another bug report.